Security has been tightened across Germany after the emergence of al-Qaeda videos threatening attacks if troops are not withdrawn from Afghanistan. Germany goes to the polls on Sunday but only one party, the Left, is in favour of an immediate pullout. Germany has over 4,000 troops serving in Afghanistan, based in the north which has seen less violence than in Helmand and other southern provinces. But 35 have died and a recent poll showed 55% of Germans wanted a pullout. 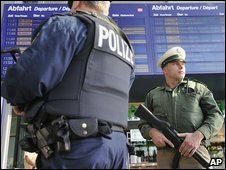 At railway stations and airports all over Germany extra police are on patrol, walking in pairs and toting machine-pistols. It is a highly visible precaution being taken after the Federal Intelligence Service (BND) assessed as credible a number of al-Qaeda threat videos emerging - in German - on the internet in the last few days. "In a democracy," says the speaker on one video, "only the people can order their soldiers to return home." "But if the German people decide in favour of continuing the war they will have handed down their own sentence." Al-Qaeda's leadership takes a keen interest in Western public opinion and has shown itself adept at exploiting Western doubts. The threat videos, made by al-Qaeda's media production arm, warn of an impending attack within two weeks of the elections if troops are not withdrawn. Al-Qaeda's leadership may be hoping to repeat what happened in Spain's elections five years ago when multiple train bombings killed 191 people. Soon afterwards, the Spanish government of Jose Maria Aznar, that had sent troops to Iraq, was defeated at the polls. German political figures have reacted to the videos by denouncing al-Qaeda's attempts to dictate voter behaviour. Newspaper editorials have also mocked the appearance of the speaker on the videos, a 32-year-old Moroccan-born German national and resident of Bonn. Bekkay Harrach, who takes the nom-de-guerre of Abu Talha al-Almani, appears in an ill-fitting Western suit and tie with drooping, greasy hair and a pale face. But his unprepossessing appearance may be deceptive. Harrach, who studied laser technology in Germany, is believed to have travelled to wage violent jihad in the West Bank, Iraq and Waziristan. He is reported to be on a list of around 100 German nationals thought to be a security threat and the authorities there are taking his warnings seriously. Gavin Hewitt: Where is the anger? Can Germany reform its economy?